Growing up, my absolute favourite (store-bought) desserts were choux and mille feuille. There was a wonderful Patisserie near my friend Ellie’s house that made the most amazing pastries and we would always bring a large box whenever we visited. Choux is really not the kind of pastry I attempt at home until, well until I asked my husband to pick one thing for me to bake from my brand new stack of baking books. He looked through them and picked Paris-Brest – a dessert concocted in France to commemorate the Paris-Brest bicycle race. I very nearly asked him to pick something else, but then I like a challenge so Pari-Brest here I come! I won’t pretend these aren’t time consuming – there are several elements that need to come together. You can make the filling a day in advance if you want to split up the workload. The trickiest part, for me, was getting the choux pastry to get crisp – I don’t think my oven was cooperating. In the end I kept the pastry in the oven for a really long time until it was completely crisp (once it gets filled with cream it softens a little). The verdict? 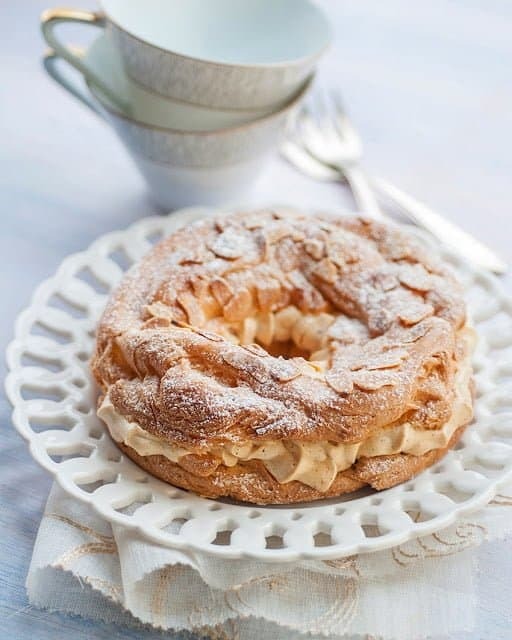 These mini Paris-Brest are definitely worth the trouble – crisp pastry oozing with silky praline crème légère. I decided to make individual pastries instead of one large one as they seemed slightly less intimidating. They are still pretty big – but I challenge you to share yours! 1. First make the choux pastry. Put the water, butter, salt and sugar in a medium saucepan. Bring to the boil until butter is completely melted. 2. Take off the heat and add all the flour. Stir vigorously until the flour is fully incorporated. 3. Put the pan back on the hob and keep stirring over medium heat until the dough comes away from the edges of the saucepan – 3-4 minutes. 4. Break the eggs into a measuring jug and lightly combine with a fork. Put the dough in the bowl of your stand mixer and mix using the paddle attachment to release some of the steam. 5. Slowly add the eggs while mixing at medium speed. You may not need to add all the eggs – check the consistency by lifting some of the pastry with a spatula. The pastry should slide down and form a peak still attached to the spatula. Let the pastry cool down for 30 minutes. 6. Preheat the oven to 200C | 400F. Draw 4x15cm/6in circles (spaced apart) on baking paper using a plate or cake tin to draw around. Flip the paper over on a large baking tray. Fit a plain nozzle into a large piping bag and fill with choux pastry. Carefully pipe a ring following the template. Pipe a second ring on the inside of the first ring and then pipe a third ring on top of the other two rings. Brush the rings with some egg wash (usually there’s some egg left over from the pastry – if not, beat 1 small egg). Sprinkle with the flaked almonds. 7. Put a small ramekin full of water at the bottom of the oven. Bake for 15 minutes then lower the heat to 150C | 300F and bake for a further 35 minutes. Do not open the oven door for at least 50 minutes. 8. Check the pastries – they should be risen and sound hollow when tapped. If they are still soft, then pierce holes with a skewer to release some steam and return to the oven (leave the door slightly open) until they they are crisp. This can take a further 20-30 mins depending on your oven. Once the pastries are crisp, cool completely on a wire rack. 1. Preheat the oven to 150C | 300F. Put the hazelnuts on a tray and toast in the oven for 10 minutes. 2. Put some baking paper in a large tray and brush with a little oil. Put the sugar and water in a small saucepan. Bring to the boil and cook swirling the pan until the sugar dissolves. Keep cooking until the caramel turns an amber colour. Tip the hazelnuts in and stir until they are covered in the caramel. Tip the praline on to the prepared tray and let it cool completely. 2. Break the praline into small pieces and blitz in a food processor for 5-10 minutes until a paste forms. The paste will be quite runny. Store it in the fridge. 1. Whisk the sugar, corn flour and egg yolks together – either by hand or in a mixer – until smooth. 2. In a saucepan over medium heat, warm the milk and vanilla scrapings until small bubbles appear along the edge of the pan. 3. Slowly pour the hot milk into the egg mixture and whisk together. Pour back into the saucepan and cook over medium heat, whisking constantly, for about 4 minutes until cream comes to a boil and thickens. 4. Pour cream through a fine sieve into a bowl and stir in the butter. Cover with cling film, pressing it directly on the cream. Make a small hole to allow steam to escape and refrigerate for at least 2 hours. 5. Whip the cold double cream until you have soft peaks. 6. Mix the praline paste (I used all of it but you may want to add less) with the cooled crème pâtissière and then gently fold in the whipped cream – thus making praline crème légère. 1. Slice the Paris-Brest horizontally in half. If you notice any raw choux then remove it. 2. Put the crème légère into a piping bag fitted with a large star nozzle and generously pipe the cream on the bottom half of the choux. Replace the top half and dust with icing sugar. Leah from Sharing The Food We Love. Just curious: Why bread flour? I have made choux with all-purpose but have begun to see bread flour pop up as the top choice. Any specific reason or is this just the recipe you prefer? Thank you for your thoughts! Very retro and so very impressive. Would it be bad if i just ate the praline paste with a big spoon? That's actually something I want to try in Paris. I've seen it on one of my favourite Polish blogs before, but I won't attempt to make it, of course I could, but maybe for some special occasion. There are too many delicious things to try and to make. I wish I was a fitness addict, at least it would help. If you have any questions please don’t hesitate to contact us at [email protected]. I think I will try this soon as I am a total fan of french pastries. Beautiful pictures! it looks wonderful! these are so heavenly. I was scared of choux pastry before but I think I have the hang of it now. I really want to make a croquembouche – I think that will be my next choux challenge. Good luck with the Profiteroles I am sure they will be a huge hit! Thanks for the trip down memory lane. For a presentation in French class in 2008, I made 3 dozen of these and passed them out while talking about my experience doing the Paris-Brest-Paris in 2007. After having a couple myself, I regretted not having enjoyed any while there. I was so tempted but was afraid they'd sit too heavy in the belly for such a long bike ride. Silly me. I came to find out that when you are cycling 1200 km in 3 days, you can eat anything you want! And when you are doing it in France, well, bonus! I can't begin to imagine making 3 dozen of these! That's a lot of work! If I were doing cycling races you'd better believe I would be eating these guilt-free. As it is my clothes are definitely getting snugger… I really must take up running again!